You don't have to wait until the Grand National for shocks at Aintree. Tales of the unexpected abound on ladies' day - not just concerning the attire of enthusiastic young female racegoers. It was the middle day of the meeting in 2003 when multiple Irish champion jockey Charlie Swan dropped a bombshell by announcing he was to retire the very next day. Three years later, Friday's headlines were made by an undercover reporter who masqueraded as a member of stable staff and caused a security scare by posing for photographs with Hedgehunter in his box. And this is the afternoon in 1985 on which Pan Arctic sprang a 100-1 shock in the novice chase for Tom Bill from Ashby de la Zouch. It is in the Grade 1 Betway Mildmay Novices' Chase that we could get something out of the ordinary courtesy of the Nicky Henderson-trained Might Bite, who appears to be doing his best to enliven the sport all on his own. Make no mistake, this is a tip-top chaser in the making. You can see that in the way he cruises along in front, jumping boldly and well. The only clue to how fast he is going is the sight of his rivals struggling in vain to keep up. If he had got to the finish without mishap in the Feltham or RSA he would have won by the sort of margin rarely seen in Grade 1 company. Twice. But 'if' is a big word in jump racing. At Kempton on Boxing Day Might Bite fell at the final fence when in complete command, 18 lengths up by our race-reader's reckoning and pulling further clear. 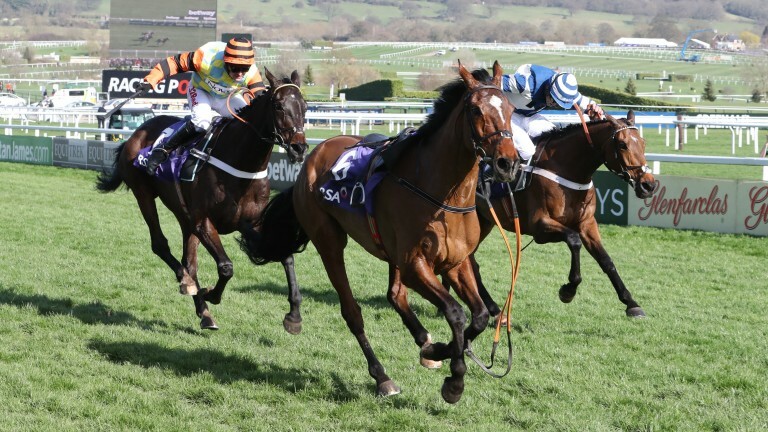 There was no tumble at Cheltenham last month but he made a mistake, veered bizarrely right on the run-in, surrendered his advantage to stablemate Whisper, then rallied to regain it in the very last stride as he scrambled to victory by a nose in the most memorable finish of the meeting. Might Bite has "got bits of character", in the words of one of his owners, but he has also got plenty of ability. He is already second favourite for the King George VI Chase and those odds will only shorten if he wins as he has threatened to on his last two outings. But punters ought to be aware this is a day renowned for fallers – and not just because of the lethal effect combination of Prosecco and six-inch heels. You expect the Randox Health Topham Chase over 18 of the Grand National fences to be incident-packed - only ten of the 30 got round in 2015 and plenty more hit the deck last year. However, it was a faller in the JLT Melling Chase that made the most impact 12 months ago, with the sadly missed Vautour coming down at the ninth fence of a race for which he started at 1-5. That allowed God's Own to score for Tom George and he's back to try again, one of seven who ran in the Champion or Ryanair Chases in a field which does not feature a single last-time-out winner - just as was the case in the Betway Bowl on Thursday. George is enjoying his best season, already two dozen winners and £120,000 past his previous highs, and he could enjoy his best afternoon here. We'll never know how The Worlds End would have fared had he not fallen two out when upsides the leader in the Albert Bartlett Novices' Hurdle at Cheltenham. He looked still to have plenty to give at the time and, whether he would have coped with the impressive winner Penhill, that rival is not in the field for the Doom Bar Sefton Novices' Hurdle. George has two chances in the Weatherbys Private Standard Open National Flat Race and it can't be with the hugest of confidence that stable jockey Adrian Heskin has chosen to ride Doncaster winner Black Op rather than Stratford winner Clondaw Castle. Then again, there are trickier selections to make on ladies' day. Reports suggest Coleen Rooney will not be here, but there will be plenty of others whose choice of outfit will be the subjerct of much comment. Ladbrokes are betting on the colours worn by Danielle Lloyd, Jennifer Ellison and Christine McGuinness - I'm sure Tom Segal will pass on his advice elsewhere. But they say 'all bets are off on a wardrobe malfunction being caught on camera'. There are some sorts of exposure racing can do without.